Sonequa Martin-Green plays Micheal Burnham in the new CBS show "Star Trek: Discovery." SAN DIEGO — With the "Star Trek" franchise now well into its 51st year, and a new TV series set to debut this fall, it's clear the iconic science fiction epic is definitely living long and prospering. But according to the authors of a book series chronicling the history of Star Trek, that wasn't always the case. "We're going to talk about where [Star Trek is] going but first we gotta talk about where it started," Mantz said, kicking off a discussion about a few of the many instances when the "Star Trek" universe might have fallen into oblivion, and what fans can expect from the upcoming TV series, "Star Trek: Discovery" when it debuts on Sept. 24. While the original "Star Trek" series is now a modern classic, its fate was uncertain for most of its run, according to the authors. And its enduring success had a lot to do with Paramount Studio's decision to syndicate it, and that was thanks to Richard Block who worked for Kaiser Broadcasting in 1969 when the show was airing. "He just kept pushing and pushing, and finally on a napkin in a bar they made a deal to syndicate 'Star Trek' on a couple of stations," Gross said. "They put it on, and it started winning the timeslot against the news. And everyone's looking around saying 'Star Trek's beating the news?' And they started bulk airing it five nights a week and blowing everything away." The late popularity of the series kicked off the creation of the Star Trek movies starting in the late 1970s. But there were a few "Star Trek" projects in the mid-1970s that never came to fruition, including a reboot of the TV series and a movie called "Star Trek: Planet of the Titans," with an extremely complicated and bizarre plot with a scope similar to "2001: A Space Odyssey," according to Altman. "They had hugely great people involved … it was going to be expensive, it was going to have an A-list director," Altman said. There were even rumors that Robert Redford had been suggested to play Kirk. But the movie was planned as a one-off, not part of a series like the movies that were ultimately made, and wouldn't have spawned the "Star Trek" we know today. Panel moderator Scott Mantz (left) with Mark A. Altman and Edward Gross (right) at Comic-Con International in 2017. The Future of "Star Trek"
The first episode of the show will air on CBS, but all subsequent episodes will only be available on the network's online viewing platform, CBS All Access, which requires a subscription fee. Altman said many fans had decried the additional cost, but Altman said he thinks it's a good thing. "'Star Trek' has had good demographics but never great ratings. And I think by CBS having [the show] on [the network's] own platform, it will ensure the longevity of the show," Altman said. "So whether 'Star Trek: Discovery' is amazing and fantastic, or just mediocre, it will be ensured a long life because it's on the platform. I also think they wouldn't spend the kind of money they are spending if it weren't for this platform … and it is quite a lot of money. They spared no expense." "Star Trek: Discovery" will also be serialized (meaning the episodes won't stand alone — they will have an overarching story such that viewers will have to watch the entire series in order to understand what's going on). That decision has been met with some skepticism by fans, the panelists said, because only one of the five previous live-action "Star Trek" TV shows attempted to do this (the rest were done in a "stand alone" format, in which viewers could watch any episode and not require any additional information to understand the plot). Serialized shows are extremely common in the modern television landscape, perhaps largely because people don't have to watch the shows on live TV, but can instead watch them online and don't have to worry about missing an episode. The TV series "Star Trek: Deep Space Nine" did incorporate serialized plotlines and was "way, way ahead of its time" in that regard, according to Altman. 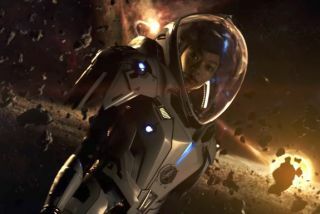 Because "Discovery" takes place before the events of the original series, the creators must deal with the difficult challenge of making the show look older than the original series, but also look good in 2017. And even though the show takes place in the past in the "Star Trek" universe, it is supposed to take place in the 23rd century (so, the future for those of us in the real world). Along with that tricky balancing act is the fact that many fans may come into the show with certain expectations about which elements from the original series should be included in the new show, right down to thinks like the design of the ship and the crew uniforms. "There's a danger of doing fan service when you go backwards, because everyone's going to have expectations of what they think should be or what they saw in their mind. And if any show is about going forward it's 'Star Trek," Altman said. "I think that for too long Star Trek has imitated itself. I'd really love to see what the future of Star Trek looks like because we've kind of got stuck in this temporal loop where we're just exploring the same eras over and over again." Mantz, the die-hard Trek fan, said, "I love fan service! Bring on the fan service!" "[But] you need new fans," Gross countered. "But at the end of the day, what's the most important thing about 'Star Trek'? It's the vision. It's the optimism," Altman said. "It's believing that we can be a better people, that we are striving to be better. The respect for science, the respect for each other, the lack of xenophobia, all the things we don't have right now in our society that need to come back."